Description: The X-Men arcade version that was released in 1992 by Konami still to this day is one of the best beat em ups of all time. Gameplay, voices, music, characters and level design are all amazing and I feel this game hit the X-Men theme brilliantly. 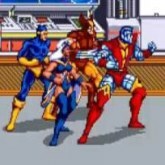 Players can choose from six characters such as Cyclops, Colossus, Wolverine, Storm, Nightcrawler or Dazzler. My personal favorite is Colossus because his special power is beasty, taking out everything on screen. The X-Men must save Professor X from Magneto. After the end of each level players will fight memorable villains. Have fun and Remember the quote from the game "Nothing Hurts The Blob" lol.